The Atacama Pathfinder Experiment (APEx) telescope used to capture detailed images of the Universe got a significant boost with the addition of the ArTeMiS camera. Artemis will help APEX take images faster and with higher pixel resolutions. The ArTeMiS camera is a large bolometer camera in the submillimeter range on APEX. A bolometer is a device that is used to measure infrared, or heat, radiation. ARTEMIS stands for Architectures de bolomètres pour des Télescopes à grand champ de vue dans le domaine sub-Millimétrique au Sol which in English translates to the Bolometer arrays for wide-field submillimetre ground-based telescopes. 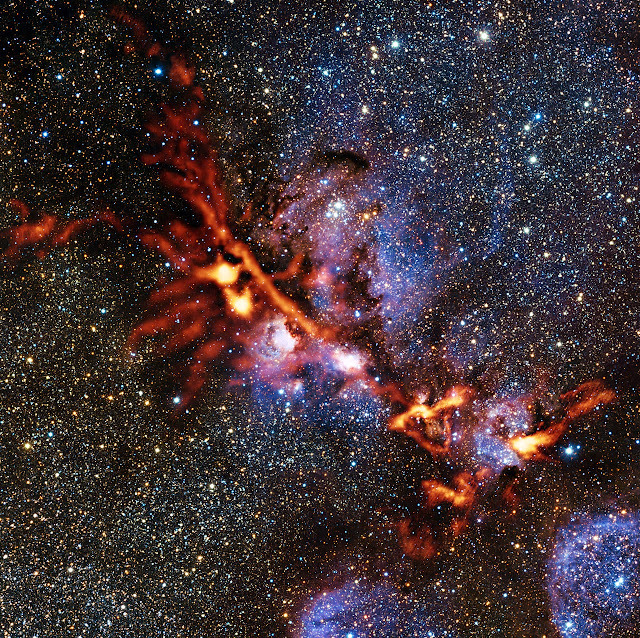 The image above is the Cat's Paw Nebula in the southern constellation of Scorpius (The Scorpion) as captured by the Artemis camera. This detailed image is significantly clearer than previous images captured by the APEX telescope alone. The APEX project is a collaboration between the Max Planck Institute for Radio Astronomy (MPIfR), the Onsala Space Observatory (OSO) and the Eurpean Southern Observatory (ESO). Operation of APEX at Chajnantor is entrusted to ESO. A new instrument called ArTeMiS has been successfully installed on APEX — the Atacama Pathfinder Experiment. APEX is a 12-metre diameter telescope located high in the Atacama Desert, which operates at millimetre and submillimetre wavelengths — between infrared light and radio waves in the electromagnetic spectrum — providing a valuable tool for astronomers to peer further into the Universe. The new camera has already delivered a spectacularly detailed view of the Cat’s Paw Nebula. ArTeMiS is a new wide-field submillimetre-wavelength camera that will be a major addition to APEX’s suite of instruments and further increase the depth and detail that can be observed. The new generation detector array of ArTeMIS acts more like a CCD camera than the previous generation of detectors. This will let wide-field maps of the sky be made faster and with many more pixels. The commissioning team that installed ArTeMIS had to battle against extreme weather conditions to complete the task. Very heavy snow on the Chajnantor Plateau had almost buried the APEX control building. With help from staff at the ALMA Operations Support Facility and APEX, the team transported the ArTeMiS boxes to the telescope via a makeshift road, avoiding the snowdrifts, and were able to install the instrument, manoeuvre the cryostat into position, and attach it in its final location. To test the instrument, the team then had to wait for very dry weather as the submillimetre wavelengths of light that ArTeMiS observes are very strongly absorbed by water vapour in the Earth's atmosphere. But, when the time came, successful test observations were made. Following the tests and commissioning observations, ArTéMiS has already been used for several scientific projects. One of these targets was the star formation region NGC 6334, (the Cat’s Paw Nebula), in the southern constellation of Scorpius (The Scorpion). This new ArTeMiS image is significantly better than earlier APEX images of the same region. The testing of ArTeMiS has been completed and the camera will now return to Saclay in France in order to install additional detectors in the instrument. The whole team is already very excited by the results from these initial observations, which are a wonderful reward for many years of hard work and could not have been achieved without the help and support of the APEX staff.